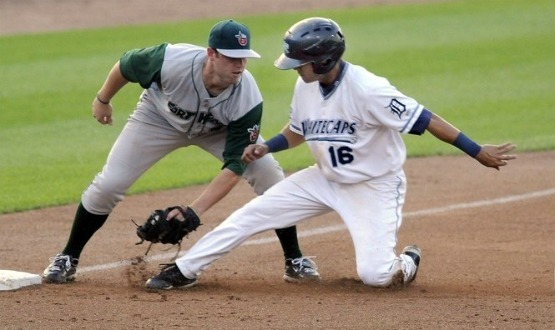 The West Michigan Whitecaps are competing in their 20th season in the Midwest League. To celebrate this event, the team is having the fans vote on the best players they’ve seen in each position for the last two decades. Even three managers are up for the vote, in Bruce Fields, Matt Walbeck, and Tom Brookens. All three won the Midwest League Championship in West Michigan. Catchers such as Brandon Inge, current Tiger Alex Avila, and Miami Marlin Rob Brantley are all up for the best behind the plate. At first base, I think that Robert Fick has the inside edge. He was voted into the first Whitecaps Hall of Fame, and has the honor of hitting the last home run in Tiger Stadium. That’s just my vote, though. Second base is my favorite position, so I’ve followed the players there pretty closely. 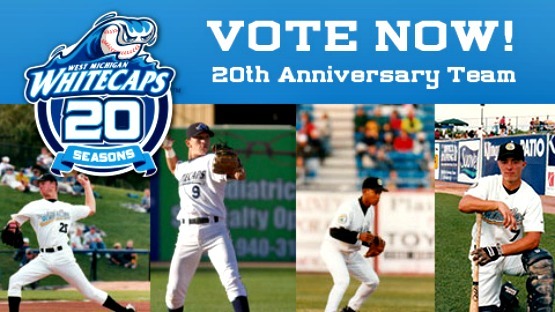 It will be tough for me to choose only one of my favorites such as Scott Sizemore, Justin Henry, and Brandon Douglas. At short stop, in my opinion, the vote might come down to current Tiger Ramon Santiago, or last’s years MiLB Gold Glove winner Eugenio Suarez, which is a tough call. At the hot corner, top prospect Nick Castellanos may be the favorite despite being moved to the outfield last season with Lakeland and Erie. He may get a push from guys like Wade Gaynor and Wilkin Ramirez, though. Fans are allowed three choices for outfielders, and there are plenty. While players like Matt Joyce, Cameron Maybin, Cody Ross, and Brent Clevlen have all seen action at the MLB level, Gorkys Hernandez had a great season in West Michigan in 2007. He was also named the Tigers Minor League Player of the Year that year. Fans are also allowed to vote for three pitchers. Players like Andy Van Hekken, Casey Crosby, Duane Below, and Joel Zumaya all found success on the hill in West Michigan. Rounding out the relief pitchers, fans can vote for two, including Michael Torrealba and Anthony Claggett. This is another great way the Whitecaps are celebrating so much success the last 20 years. VOTE NOW! Ok, I’ve been slacking a bit on my Whitecaps coverage, but at least I’ve been to more games this season that the last few years, so that more fun that’s just reading the stats. The Whitecaps are off to a solid second half, so here’s hoping they can stay hot and continue their playoff streak. Inserted are photos from the ‘Caps recent series with the Fort Wayne TinCaps from the Grand Rapids Press. Happy 4th of July everyone…. First Half: The Whitecaps really struggled early this season, with such a young roster, but were able to battle back a bit. They ended the first half 32-37, which was good for 6th in the eight team division. What’s impressive, is that they went through a rough 12 game losing streak early in the season, so being able to recover from that is a positive sign. Second Half: West Michigan is off to a solid start in the second half of the season, going 7-4, which is good enough for second place in the East one game behind the Dayton Dragons. Outfielder Jeff Rowland is off to a great start in this second stint. He’s batting .400 with four doubles, six walks, and a .600 OBP. 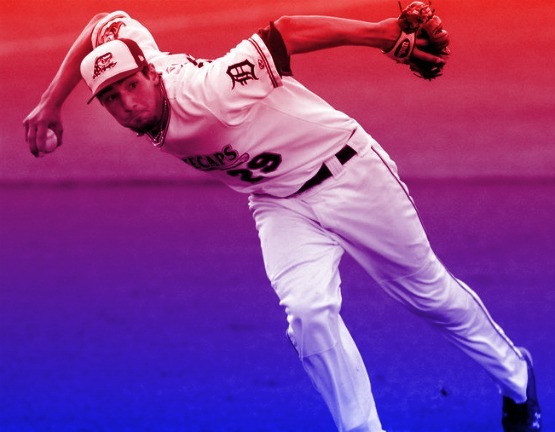 The pitching staff is also getting the job done for the Whitecaps. Their starters have had seven quality starts in the first 10 games and are 3-1 with a 2.22 ERA. The team has gone 17-8 since June 3 and are almost at .500 for the entire season. Team Leaders: Rookie sensation Nick Castellanos is emerging as a team leader, despite having a slow start to his first full pro season. He’s leading the ‘Caps in batting average with .306, RBI’s with 48, and SLG% with .441. James Robbins is leading the team in home runs with 10, and Luis Castillo is tops with a .369 OBP. On the mound, Kevin Eichhorn leads the team in three categories of his own: wins with 6, SO with 68, and a 1.17 WHIP. Antonio Cruz has the best ERA with 3.29, and Bruce Rondon is tops with 15 saves.